Maa Bhoomi Telangana is an online portal of the Revenue Department (i.e. Chief Commissioner of Land Administration, Government of Telangana). It is an initiative of the state government to digitize the record keeping of the land and property of the citizens of the state. In this article, citizens of Telangana state will get all the important details about Mahbhoomi Telangana. 3 How to check Telangana Pahani, Adangal, ROR- 1B? 4 How to obtain Certified copies of ROR-1B and Pahani? Maa Bhoomi Telangana is a portal that provides facility of digitization of all the records of land of the state of Telangana. Through this portal, Telangana citizens can easily access their land records online without any difficulty. All the records of Revenue departments related to land and property of the citizens of the state are maintained in the portal. Through Mabhoomi website, citizens can view details of their land account no., Pahani/Adangal, ROR 1B, land Mutation etc. Citizens can also file complaints to make correction in the land records. How to check Telangana Pahani, Adangal, ROR- 1B? Citizens of Telangana can check Pahani/Adangal by visiting the Meeseva Centre or through online mode. 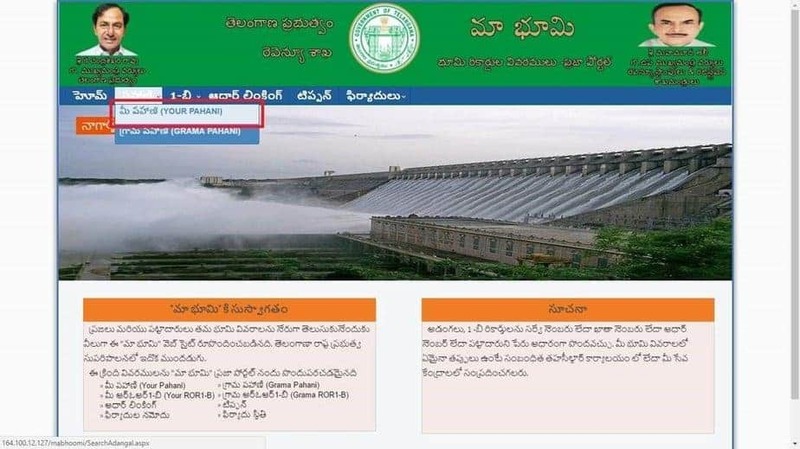 Citizen have to visit the Maa Bhoomi website. On the homepage, they have to open the Menu bar and have to click on “Your Pahani” option. Now, citizens have to select the district name, zone, village name and hit on “Click” button. Now all the land details will be displayed on the screen. On the homepage, they have to click on the “Know your land status” link. Now, citizens have to select district, division, mandal, village, khata no. or survey no. and have to click on “Get details” option. ROR-B and Pahani details will appear on the screens. How to obtain Certified copies of ROR-1B and Pahani? The information mentioned in the aforementioned portal is just for information purpose and cannot be produced as an authenticated/ certified copy at the courts for enforcing any legal claims. 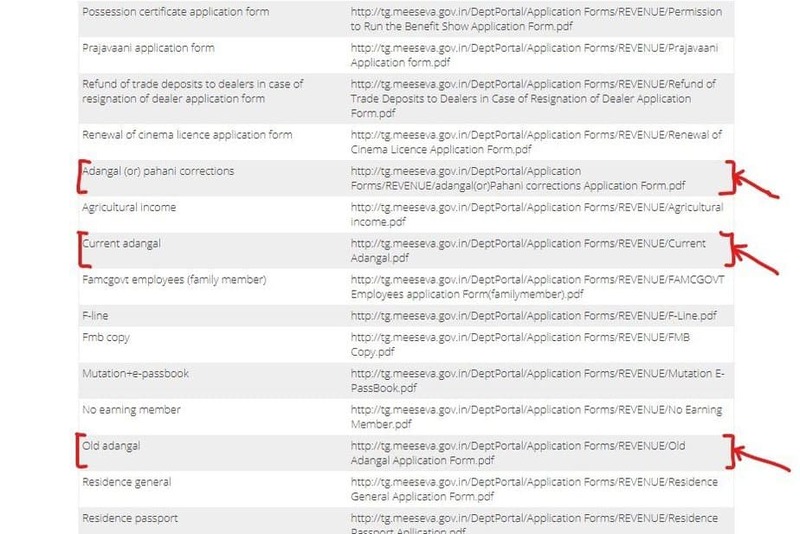 Citizens can obtain the authorized and certified copies of Pahani, ROR 1B and other land related information through the “MeeSeva” portal. 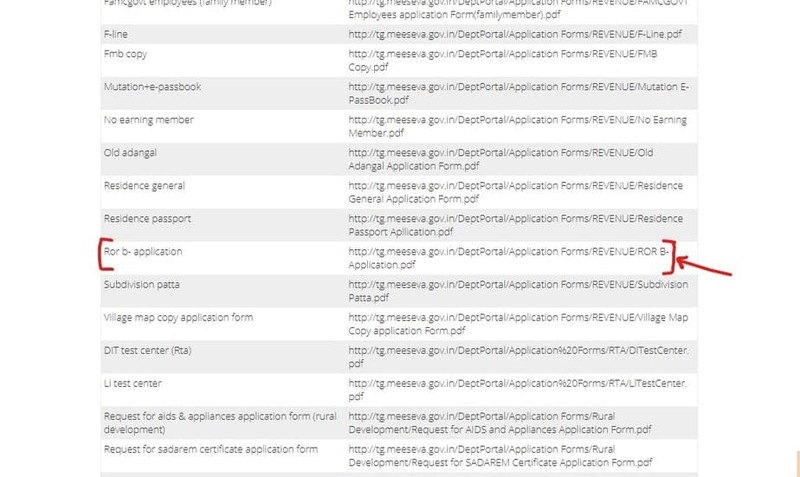 To obtain all these certificates, candidates have to fill separate application form for each document. Citizens have to visit http://tg.meeseva.gov.in first. On the homepage, they have to click on the “Government Forms” link. 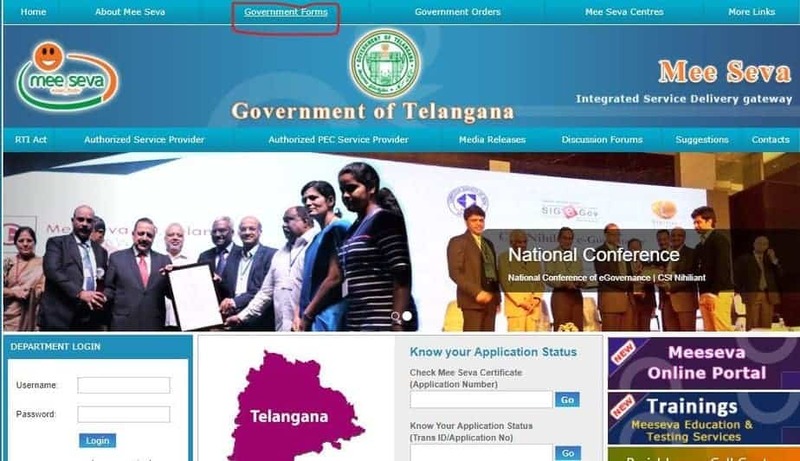 Candidates will be redirected to external link of Telangana state portal i.e. 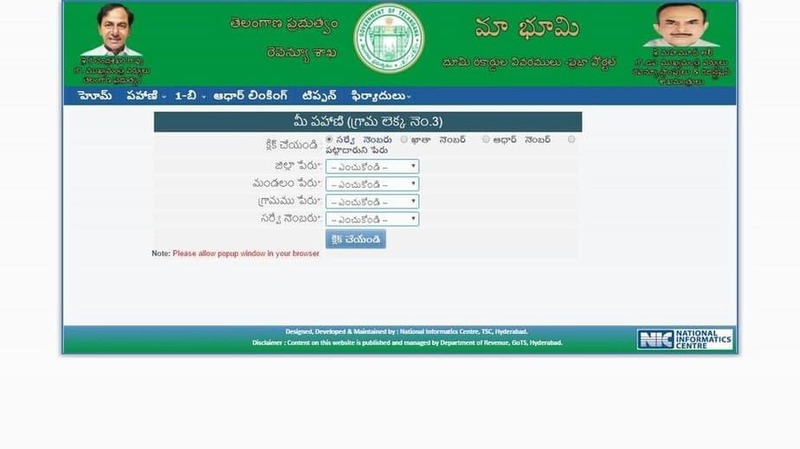 www.telangana.gov.in and a new page will appear on the screens as shown in the picture below. Now, candidates have to select relevant links provided in the front of the various services offered. Lastly, candidates have to the relevant application form, fill them and have to submit along with all required documents. The digitization of land records has lots of advantages viz. It makes the recording of land data easy and accurate. Reduction in manual work of handling thousands of files and records. The online portal saves time. It is transparent system that helps in reducing crimes and illegal activities related to the land and property. Now, citizens do not have to visit the tehsildar office just to get a single form. Citizens can check their land record details such Pahani, Adangal, ROR 1B or Khasra no. and other details at any time just by visiting the online portal. What is Adangal or Pahani? Pahani or Adangal is one of the legal document related to land. It contains information of the land holding/property of an individual. In Telangana, Pahani/Adangal is issued by the Tehsildar of the particular tehsil. Name of the owner of the land and the account/ Khata no. Before the digitization of land records in the state of Telangana, citizens have to visit the tehsildar office to get even a single piece of information related to their land holding. But with the introduction of Mabhoomi or Meeseva portal, it has become easy to check the details of land records with the help of internet at any place and at any time. Record of Rights (ROR 1B) is an important document related to the land and holding. It is an extract from the records of the land/ property maintained by the revenue department of the state. It is a document that contains the information about land or property and also about the history of land. ROR is known by various names in the different parts of the India such as Khasra, Khatauni, Khatian, Jamabandi etc. If you have any query then you can ask us in the comment form below. the website should be restored as soon as possible.